Now, there are bread makers and there are BREAD MAKERS! I think the very stylish Panasonic SD-ZB2502 would take some beating in looks and more importantly performance. Having owned, and been using an older Panasonic model (the SD-255) for a few years now (and I might point out I was still using it till this fancy one arrived) I can tell you even though my older model is fantastic there was one thing that always bugged me - and that was the way you set it the programs. You selected them and they went round in a loop which made it sometimes quite confusing to set. That said, believe me it doesn't take much to confuse me. With this one however I'm pleased to say it really is a doddle to set since it's done by simply select a menu number. The bread pan is longways as apposed to sideways as it was in my older machine - this is far better since this breadmaker takes up far less room on the kitchen worktop. Of course this bread maker isn't all about making bread - far from it. 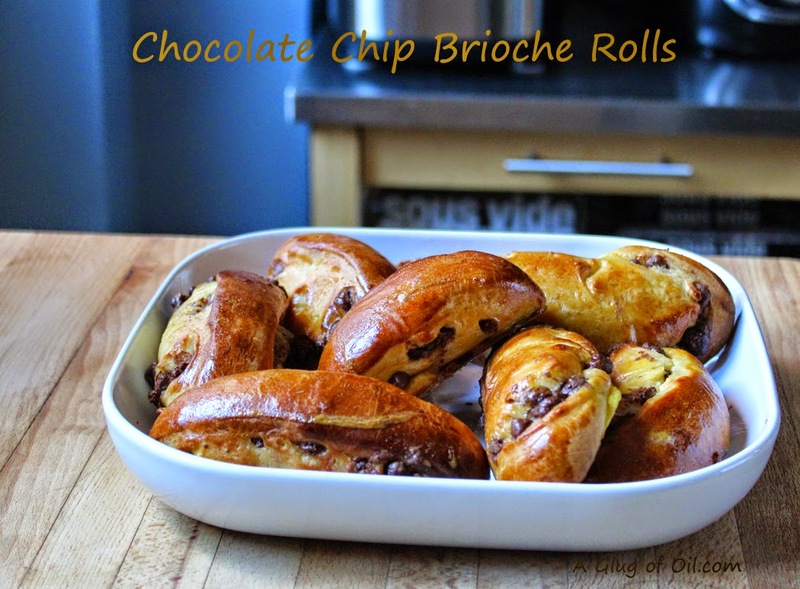 Without an ounce of baking knowledge you can and I did, even if I do say so myself, create pretty decent looking Chocolate Chip Brioche Rolls and even Tear and Share Bread But it can also make Pizza Dough, Bake Cakes and even make Jam. 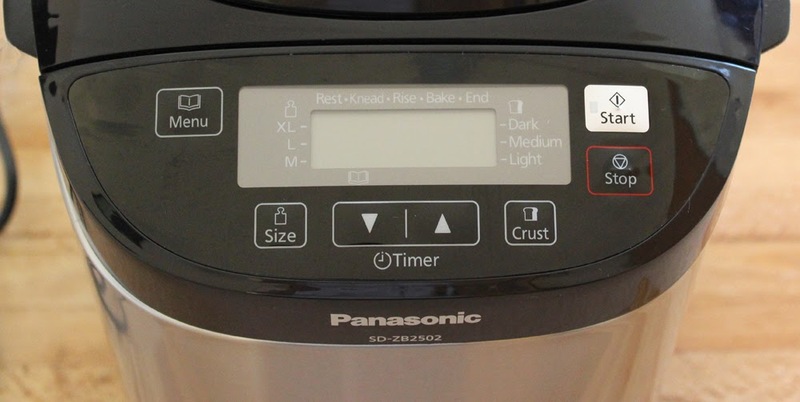 Another improvement on older Panasonic models is the Yeast Dispenser - previously to this you would add the yeast to the bread pan along with the other ingredients taking care to keep it away from the water or salt which would ruin the loaf if they mixed using timer delay mode. With this model the yeast is added to the yeast dispenser (round hole in picture above) which insures the yeast isn't mixed with other ingredients until it needs to be and the machine will automatically add it at the correct time. 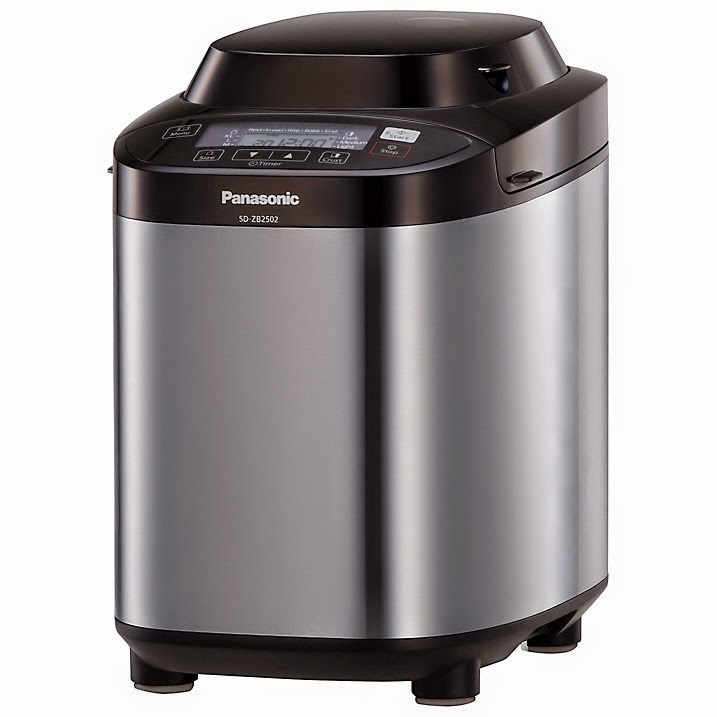 What can the Panasonic SD-ZB2502 Bread Maker do? What can't it do is more to the point! Speciality Mode enables you to use various grains and flours like Spelt flour which cannot be made into a loaf easily on their own. The Rye Bread Program together with the unique mixing blade can create a range of tasty loaves using Rye and Spelt flours. Unique to Panasonic, the Yeast Dispenser drops the yeast automatically at the optimum time during baking. The Raisin Nut Dispenser adds additional ingredients to your recipe ensuring the best loaf every time. The 100% Gluten Free bread program allows you to bake gluten free loaves, using a wide range of gluten free bread mixes and flours. Giving you the convenience of having freshly baked bread that is tailored specific to your taste and needs. The Panasonic bread machine adapts to your life. Whether it’s a smaller loaf for yourself, or an XL loaf for your loved ones, making the perfect loaf couldn’t be simpler. It is even possible to determine how light or dark you would prefer your loaf, by simply selecting the desired browning level. The Panasonic Breadmaker can not only bake, but using the new Jam and Compote Mode you are spoilt for choice when creating your homemade jams at home. 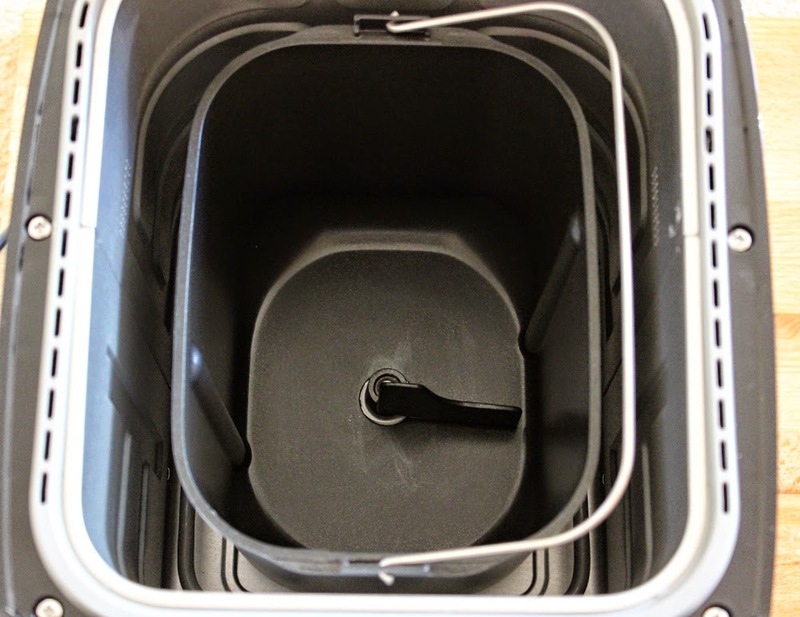 There are 8 jam and 6 compote recipes available in the breadmaker operating instructions to help you along the way. This machine is really very easy to set, just decide which recipe you'd like to make from the recipe book and using the menu button, press until that number is shown, of course you must add your ingredients (the book tells you the ingredients and measurements needed for your chosen recipe) then you can either select START or set the TIMER (up to 13 hours time delay) a few recipes aren't suitable for delayed start but again the book tells you. As you can see from my picture above I actually managed to make Chocolate Chip Brioche Rolls and let me tell you they were seriously good. The machine makes the dough for you and all you have to do is roll it out and add the chocolate chips, fold and roll again then shape into rolls, glaze and bake. The inside honestly looked just like any brioche I've ever had before and tasted equally as good as when bought and baked fresh from a bakers shop. 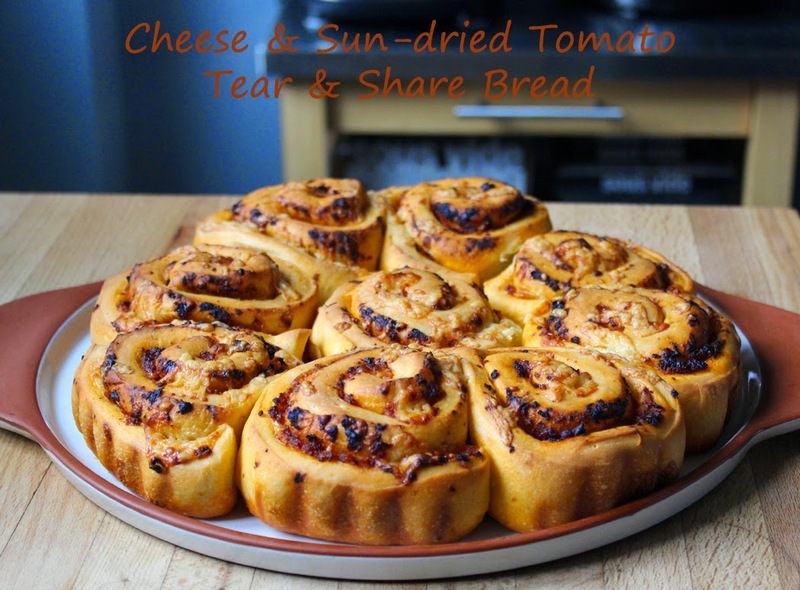 Next up I tried Tear and Share Bread, the supplied recipe book gives a few ideas for fillings but since I didn't have everything to hand t make the suggested fillings, I used half a jar of Sun-dried Tomato Paste and sprinkled with a good amount of Cheddar Cheese. Another good job done I think you'll agree? 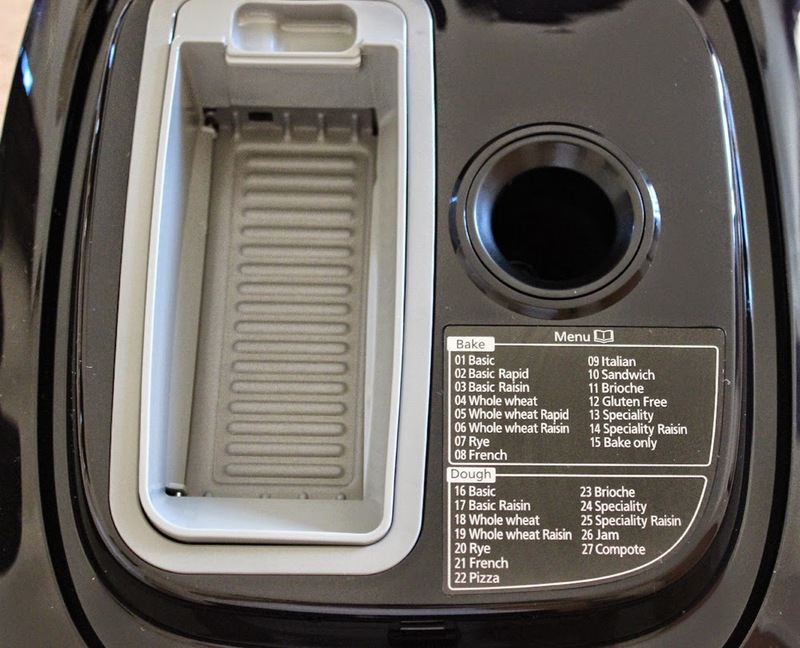 If you're considering buying a bread machine I would highly recommend Panasonic since the automatic Raisin Nut dispenser takes the hard work out of adding them at the correct point in a recipe - for example you would have to listen out for a beep and actually be there to do this. This machine does all that for you. After all what would be the benefit of having a bread machine that you have to sit and watch? So with this one your fruity loaf or seeded bread is all taken care of without the need for you to be there. Panasonic say; 'The non-stick bread pan and kneading blade are coated with diamond particles, to ensure you will be able to easily remove bread from this unit once cooked'. I say; Yep, another great improvement and it does work. A freshly baked loaf easily slips out of the pan whereas before it was a struggle sometimes and I could easily have thrown my old bread maker across the room - just saying. Before this post gets too long I'm going to leave it at this. But I'll do another very soon with how I got on making Bread which was all good by the way. At the time of writing I haven't made Jam so in the next post I'll tell you about that too. *Update - I have now made jam which turned out perfectly! You can read how I got on here. Selling at around £139.99 I think although that although you can buy other brands as cheap as thirty odd quid you really won't get the quality or different functions that this can do, nor would you get the same great results. So it might sound expensive but this machine is worth every penny and certainly wouldn't disappoint. This Panasonic breadmaker is available in local John Lewis, Currys, Argos, and Lakeland retail stores and online at Amazon. and by Helen over at Fuss Free Flavours. Disclaimer: I was sent this Panasonic Bread Maker for the purpose of this review. All thoughts and opinions are my own and are not meant to influence readers buying choice. I was not required to write a positive review. A breadmaker that makes jam too! How fabulous! Looks like a great machine! And I can't decide which of your two creations I like the look of most - both look like just my sort of thing! That sounds like a really good bread maker, Jan. Your breads look very professional and you didn't choose the easiest of recipes. Look forward to seeing you make jam in it too. You've already created some fantastic looking breads with your fancy new machine. If I were to get a new machine I will definitely consider this one. The features really look very useful, esp the yeast and nut/fruit dispensers. Enjoy your new toy!